The Department of Tourism (DOT) is taking a look at the feasibility of the 10.8-kilometer concrete bridge, the longest-to-be in the country, proposed for construction as a tourism highlight connecting the island-province of Catanduanes with the Bicol mainland. Maria Ong-Ravanilla, the DOT regional director, said over the weekend here that the Tourism Infrastructure and Enterprise Zone Authority (TIEZA) has been tasked by Tourism Secretary Ramon Jimenez Jr. to conduct the feasibility study of the proposed project following its recent endorsement by the Regional Development Council to the national government. The TIEZA, which is formerly called the Philippine Tourism Authority, is an attached agency to the DOT mandated to designate, regulate and supervise the Tourism Economic Zones (TEZs) established under Republic Act No. 9593 or “The Tourism Act of 2009. It is also tasked to develop, manage and supervise tourism infrastructure projects in the country and regulate the cultural, economic and environmentally sustainable development of TEZs toward the primary objective of encouraging investments. Called by Catanduanes Governor Araceli Wong the Friendship-Tourism Bridge when she introduced the plan for the project late last year, the ambitious structure would be a two-lane concrete bridge that would cross the 10.8-kilometer distance over Maqueda Channel, the narrowest body of water that separates the island from the Bicol mainland. Its endorsement for adoption was made by the RDC to make it part of the Aquino administration’s countryside development agenda that listed Catanduanes as among the country’s tourism growth areas, according to Ravanilla. In the study, the TIEZA, Ravanilla said, would determine first the feasibility of the project based on ecological considerations so as to avoid conflict with policies involving ecological protection. The project’s economic impact will at the same time be taken into consideration in the study to ensure that it is in agreement with and in support of declared national policies that make tourism industry an essential component of the national economy. To pass the feasibility test, it must also directly or indirectly benefit its host community by serving as an economic catalyst by way of creating employment and other livelihood opportunities, Ravanilla said. The sustainability of the project—referring to its ability to generate sufficient revenue that will answer for the cost of services, maintenance and operation within its projected lifetime -- will also be measured by the TIEZA during the conduct of the study, she said. Other considerations in the project study are the stakeholders that primarily include the community in its immediate vicinity and the government agencies that will affect or will be affected; and the financial matters involved in its implementation. In taking into consideration the stakeholders, consultations are required while in the financial matters, the capability of the proponent local government to put up a counterpart shall be calibrated according to its income classification which in the case of Catanduanes, a third-class province, would be not less than 10 percent, according to Ravanilla. Each area of consideration guiding the conduct of the study carries with it points for the project’s scorecard that TIEZA will be following in determining its feasibility and should it score good enough to pass, chances are, this proposed project would become a reality so that Bicol becomes site of the longest bridge in the country, she said. It will be five times longer than San Juanico that presently holds the "Longest bridge in the country" title with its 2.16-kilometer span linking Samar and Leyte provinces. In a statement, Wong said she is elated by the attention the DOT is giving to the project and she feels excited about it even as its actual implementation is still a distance more from realization. She said foreign investors have expressed interest in financing the project once it is approved for implementation by the national government. 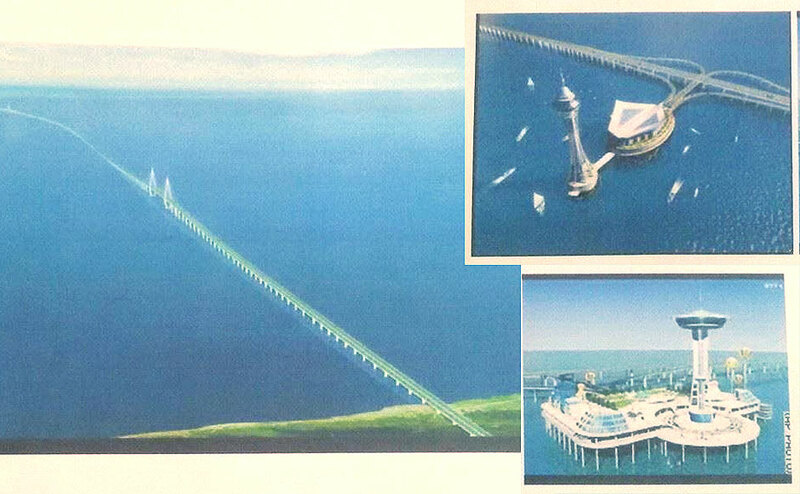 The bridge will be designed similar to China’s Hong Kong-Zhuhai-Macau Bridge that is now ongoing construction, Wong said. “It may not take too soon to materialize but yet, we have started the process that later would, as I firmly hope, pave the way to a dream come true that shall see the total development of our island-province as a haven for investment in tourism and other aspects of economic progress,” she said. Apart from facilitating easier transportation modes, Wong said, the project is also seen to make way for power cables of Luzon grid, ending the energy shortage confronting the province. As an off-grid province that had some 45,000 power consumers, Catanduanes relies on diesel–fed generator systems and three hydropower plants that often times would break down and cause brownouts, beside the fact that the rates being charged are higher compared to the mainland. The island is part of the Triple C (3C) cluster of tourism areas in Bicol, wearing the moniker “Gems of the Pacific” which is on its way to development that is seen to contribute significantly to the growing tourism industry of Bicol. The 3C is the alliance of three provinces—Catanduanes, Camarines Norte and Camarines, including all their cities and municipalities -- into a Tourism Development Area (TDA) which the DOT has placed under its 2015-2020 National Tourism Development Plan.